Although Microsoft has struggled the past few years with both an outdated software business that depends on the sale of personal computers and a market-lagging mobile phone unit, Microsoft's latest earnings report shows the company is regaining its footing under new CEO Satya Nadella who is pushing the software giant to embrace cloud computing. The Redmond, Wa. company reported fiscal-first quarter revenue of $23.20 billion (about £14.45, AU$26.35), topping Wall Street estimates of 49 cents per share on revenue of $22 billion, according to a consensus estimate from Thomson Reuters. Commercial cloud revenue increased 128% driven by Office 365, Azure and Dynamics CRM, the company reported. Microsoft said its Devices and Consumer operating unit revenue grew 47% to $10.96 billion (about £6.82, AU$12.45). That included Surface revenue of $908 million (about £565, AU$1.03 billion) and phone hardware revenue that exceeded $2.6 billion (about £1.6, AU$2.95), with 2.4 million Xbox console units sold. As far as Windows Phones, Microsoft said it sold 9.3 million Lumia smartphones worldwide, which amounted to marginal growth in its 2.5% share of the smartphone market currently dominated by Google Android devices and Apple's iPhones. The company's results included $1.14 billion (about £700 million, AU$1.29) in "integration and restructuring expenses" related to the laying off of 18,000 employees, many of which are related to the acquisition of Nokia's handset and devices business. 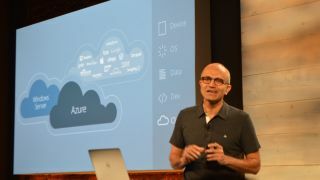 The positive results show that CEO Satya Nadella, who took over from longtime Microsoft chief Steve Ballmer in February, is making progress in helping shift Microsoft's strategy away from the PC business and toward the cloud, mobile, and subscription services. Investor confidence was also buoyed by Microsoft's announcement during the earnings call of a $2.9 (about £1.8, AU$3.3) billion stock share buyback, which CFO Amy Hood said "we are proud of because it shows how committed we are to increasing shareholder value."